Regarding Grief and Gratitude As an artist and a storyteller I am caught somewhere between actual, real objects, and the stories connected to them. 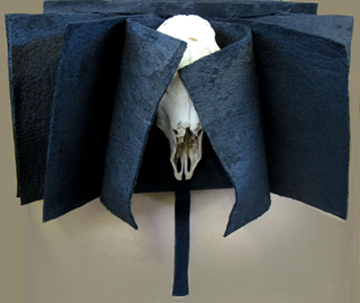 The bones I have used in this work, which were found or given to me, are real and are mostly from domestic animals we consume as ‘meat’ without thinking about them as animals. Though I believe all of creation is sacred and to be respected, these remains are not meant as fetishes of any kind. They are simply scavenged fragments – the evidence of death for the task of remembering life. My basic intent is to honour them and in so doing to acknowledge that, as a consumer, I have benefited from their demise. I am also implicated as a consumer in the mismanagement, poor stewardship and lack of care concerning the animals they represent. I have been drinking the milk and eating the eggs and wearing the skins and digesting the flesh of animals all my life. I use the bones and other animal remains in Found Wanting as a ‘reality check’ against my ingratitude and to remind myself there is never a feast without a sacrifice. … each of the bones, and all the remains of the animals that I use, carry an inherent personal story of their own, a presence outside the various contexts of definition I give them. Found Wanting is about giving them a voice. It is not about only facing the brutal tenderness of their dying but regarding how much our own mortality is connected to theirs. I am grateful to be part of the manifold diversity and incredible design of creation and mourn the loss of our sense of wonder about it and connection to it, as much as I mourn the loss of endangerment of species. But the work is not a protest. It is a lament. It is a story, a song, about grief, but a grief filled with hope; knowing if the right choices and the right sacrifices are made, the end of our stories can change. This work is a major installation piece taking up several hundred square feet. The image here is on the cover of the catalogue. Found Wanting is an Imago project.